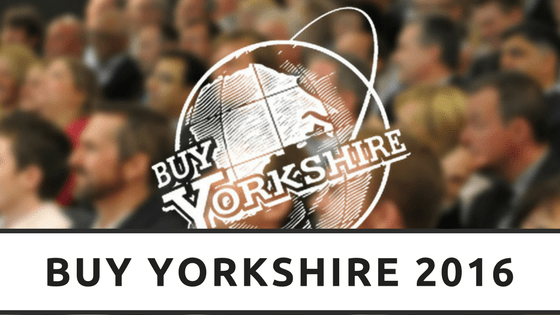 #BuyYorkshire – What an event!! We attended the #BuyYorkshire 2016 event this week and can not wait to share what we learnt. The 17th and the 18th of May saw me at the #BuyYorkshire exhibition and seminars in The Royal Armouries, Leeds alongside hundreds of other business owners and personnel. There was hundreds of stalls advertising the services and wares of companies, from digital marketers to local Universities and everything in between. I had fun meeting a variety of people from these companies and making new connections. I learnt about their services and how they assist other businesses expand and grow. I will be happy to forward on details of anyone I met to those needing support within your business, just email me your requirements and I will see who I have in my contacts list. #BuyYorkshire is run by the Yorkshire Mafia who also run Leeds Biz Week in October (another event I will be attending), The Yorkshire Sportive, Yorkshire Mafia cycling club and many more networking events throughout the year. The Yorkshire Mafia is a new model of business support. It’s big society for business. It plugs the gaps following the decline of the regional development agencies and Business Link advice network. It makes a stand for Yorkshire and Yorkshire business. It brings businesses together to share, learn, support each other and ultimately, where appropriate, trade. It enables members to support and guide each other in meaningful numbers and in meaningful ways through sharing wisdom and expertise both on-line and offline. Offline, we meet in various guises from small round-tables sharing best practice and expertise to larger more social events for over 500 people to our mighty annual conference (over 2000 expected). I was lucky enough to take part in some amazing seminars teaching us about digital marketing, never giving up and embracing change within business, all given by some amazing speakers and even some famous faces. Over the next few days I will be posting blog posts about the seminars I was lucky enough to partake in and sharing the advice I have taken away from them. These will start with a delightful seminar from Jessica Zeun, from Vodafone who discussed digital marketing and the impact it has on business. I hope you will enjoy the following blog posts and if you were there I would love to hear your experiences and what you enjoyed the most!